Top, left to right: Jerusha W. & Larry N. Bottom, left to right: Peilin Z. & Ally M.
Q: What skills or abilities are essential to being successful in your internship? JW: The skills and abilities I have found to be essential for an intern position are communication, teamwork, and adaptability. These three key skills have been helpful in achieving success on the job. My supervisor’s open door policy and co-worker’s willingness to help has made communicating my wants, need, concerns and confusion easier. Many of my projects have required me to work with a team, and teamwork is necessary to complete these projects. Lastly, being able to adapt to quick changes has also been an essential part of being successful. Q: What tools or resources does the City provide to be productive and effective in this internship? 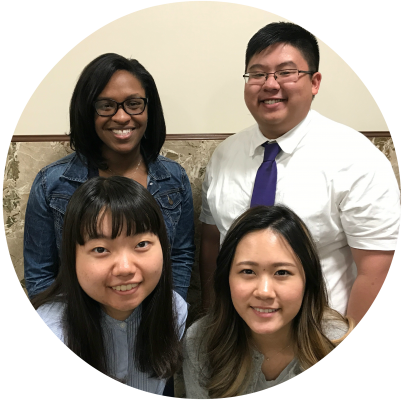 LN: When starting my internship at the City of Saint Paul, I was set up with all the tools and resources I needed to be a productive member of my department. This was my first internship and I was very eager to learn as much as possible. I had great mentors in the payroll division, who answered all my inquiries and taught me things I wanted to know. In the short time I have been here, I know the City takes great responsibility to ensure City employees are in positions where they can be most effective. I recall a time when I attended a training meeting with my supervisor, everyone was an active participant and enjoyed the training together. The City of Saint Paul is a wonderful place to work, and I hope to one day be back to work for the City and its people. Q: What was the proudest moment of your internship? PZ: The proudest moment during my time here was when I finished reviewing nearly three hundred applications for one of the job postings and realized that I might have just influenced people’s career by deciding whether they have passed or failed the minimum qualifications. Furthermore, it occurred to me how important it is for HR to be unbiased, objective, and also be able to apply the same standard to all applicants when looking at resumes and experiences. Our decisions are important as we decide someone’s future career! Q: What projects have you worked on that have been particularly interesting? AM: As an intern, I assist the Office of Human Resources through a variety of projects ranging from preparing and attending career fairs, to strategizing recruitment efforts. Every project I work on here is valuable, and I learn a lot from each of them. The project I would say is the most interesting, and my personal favorite, is creating weekly Posted e-newsletters that we send out every Tuesday. This is a great communication tool for informing the public about updated job lists, current events and news within the City of Saint Paul’s HR department, as well as career-related articles. It is rewarding to see my efforts and work get sent out for many to see!